Most of us have experienced this before. You get home, open the garage and it stops halfway and it then closes itself again. Garage doors often seem like they might be possessed by some unholy spirit and have a mind of their own. 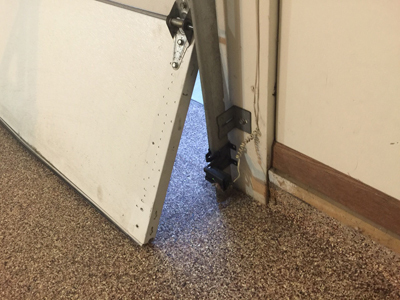 This is often the case if you don’t perform regular maintenance on your door components. First identify your problem, what isn’t working like it should? After you have done this try to use some initiative, if it looks like something is stuck in the tracks then take it out, if something is loose, tighten it. If there is toast stuck in your toaster then you make a plan and get it out. The same principle applies for garage doors. Write down as much as you can about the problem, in as much detail as possible, if it makes sense when you read it then you’re on the right track. Now find a manufacturer name and advise a specialist from garage door repair company in Lynnwood. They would be more than happy to give you some advice if the problem you’re facing isn’t a major one, free of charge over the phone. If the time has come to get a professional to look at it, don’t feel bad as some problems require professional knowledge and experience to identify and repair. Your work doesn’t end here, if you want to save your future self some money, pay close attention to what the repairman is doing. If what they are doing seems simple enough to do then write it down. Ask the repairman questions on how you can avoid certain problems from happening in the future and if it does, you’re prepared.